A key index of gold stocks is hitting its first level of major potential resistance since its false breakdown to all-time lows in January. Flashback to January 26 of this year. 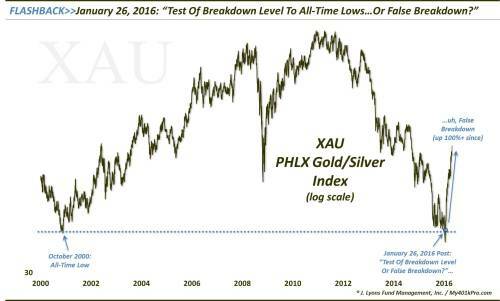 The PHLX Gold/Silver Index, or XAU – the longest running index of gold stocks – was recovering from its breakdown earlier in the month to all-time lows. That day, the XAU was testing the breakdown level around $43. Our Chart Of The Day and accompanying post linked above queried “Will this test of the breakdown level lead to a false breakdown, or the start of a new leg down?” Well, 3 months and over 100% later, that answer couldn’t be more clear. The October 2014 breakdown level that led to an acceleration of the cyclical post-2010 decline. This “pivot” level also represented the triple lows in 2013-2014 and subsequent test in January 2015. The XAU traded above this resistance today, reaching nearly $88 before closing at $86.90. Is that enough to signal a breakout of this resistance? Not in our view. It will take a much more decisive move above $86 to convince us that it has overcome the resistance. This is due in part to the variability of these lines of resistance, considering their long-term nature, especially the post-2000 Up trendline. Furthermore, it would be much healthier and constructive to see the XAU consolidate near these levels a bit longer to “digest” the 100%+ gain of the past 3 months. By running straight through these levels after almost no pause (~6 days) when it is so extended, the XAU runs the risk of exhaustion and a failed breakout. That action could lead to a more prolonged and damaging pullback than if it simply consolidated for a bit longer before breaking out. Regardless of how things transpire, in our view, above roughly $86 in the XAU appears to be bullish, opening up potential upside to above $110 as the next level of resistance. Below $86 and the index could struggle. Again, this wouldn’t necessarily be a terrible thing if the XAU consolidated its recent gains before launching the next leg higher. Roughly the $70 level may be the best level of support below should the XAU pause here. The last time we mentioned that gold stocks may be at an important juncture, they went on to rally over 100%. 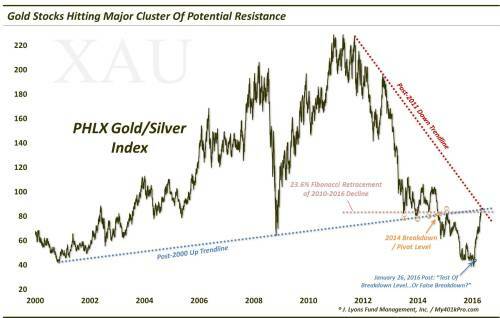 While this juncture may not be as critical, it could be the biggest test yet in the impressive gold stock rally.